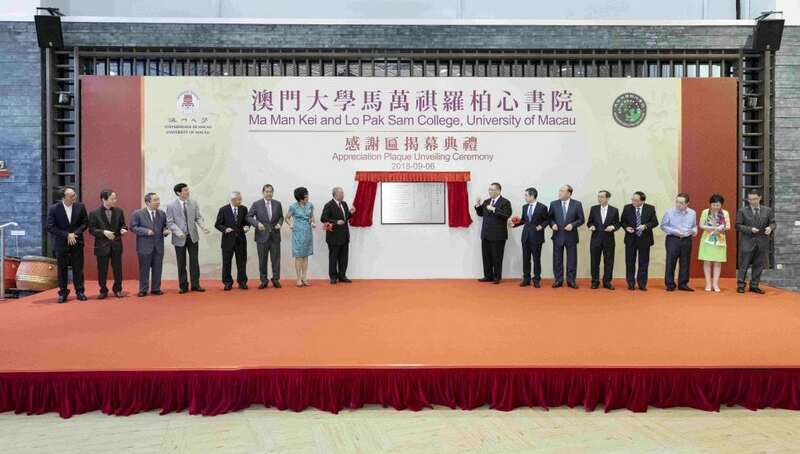 In order to support the University of Macau’s (UM) long-term development, Lo Pak Sam Memorial Limited in 2015 donated MOP 30 million to the University of Macau Development Foundation (UMDF) to support the effort of UM’s residential colleges to promote whole-person education. To express its gratitude to the donor, UM named one of its residential colleges as ‘Ma Man Kei and Lo Pak Sam College’ and held an appreciation plaque unveiling ceremony for the college today (6 September). 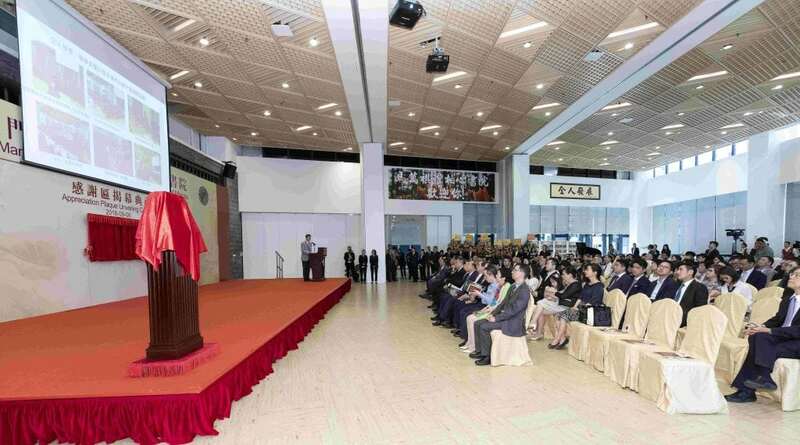 Officiating guests at the ceremony included Chui Sai On, chief executive of the Macao SAR and chancellor of UM; Ho Hau Wah, vice chairman of the Chinese People’s Political Consultative Conference; Zhang Rongshun, deputy director general of the Liaison Office of the Central People’s Government in the Macao SAR; Wang Dong, acting commissioner of the Office of Commissioner of the Ministry of Foreign Affairs of the People’s Republic of China in Macao; Ho Iat Seng, president of the Legislative Assembly of Macao; Ma Iao Hang, Ma Iao Lai, Ma Iao Wai, Ma Iao Ian, Ma Iao Wai, Ma Iao Son, Ma Iao Iao, and Ma Chi Kong; Lam Kam Seng, chair of the UM University Council; Lionel Ni, acting rector of UM; and Xu Debao, founding master of Ma Man Kei and Lo Pak Sam College (MLC). In his speech, Lam expressed his appreciation to Lo Pak Sam Memorial Limited for its donation to support UM’s development, adding that UM named its ninth residential college as ‘Ma Man Kei and Lo Pak Sam College’ based on the request of the donor. He said that Dr Ma Man Kei was respected by everyone and was an exemplary model, adding that he was already very supportive of the university’s development when serving as the University Council chair of UM’s predecessor, the University of East Asia, between 1984 and 1988. His wife Lo Pak Sam was dedicated to charitable causes for women, children, and education, and made various contributions to education development in Macao. Lam hopes that the college’s faculty members and students will build on the current achievements and usher in a new future, so that the college will become a base for promoting whole-person education and the well-rounded development of the students. Ma Iao Hang, representative of Lo Pak Sam Memorial Limited, said that his parents loved China and Macao and contributed to the country and city throughout their lives. The donation to UM’s residential colleges is an extension of his parents’ will to contribute to education development in Macao. He hopes that the college will nurture students into caring and socially responsible individuals who can grow in a multicultural and challenging environment. Xu Debao, founding master of the MLC, thanked Dr Ma Man Kei and his wife Lo Pak Sam for their selfless contributions to the college. The MLC attaches great importance to whole-person development and aims to nurture graduates who are biliterate, trilingual, and honest, with good manners. The college will always remember the support and teachings of Dr and Mrs Ma and will continue to implement its educational philosophy, in order to produce more outstanding graduates to give back to Macao and China. UM has Asia’s largest residential college system, which is currently comprised of ten colleges. These colleges provide students with whole-person education through experiential learning courses, so that students can develop soft skills in addition to professional expertise in their chosen areas of study.